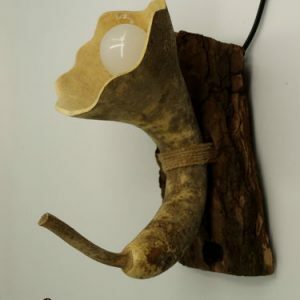 Ambient wall lamp.2 craft wall lamps made with gourds. Designed for custom work, two bedroom lamps carved with a “lauburus” (Vasque country ethnic symbol). Designed to achieve a natural and unique lighting in a bedroom with rustic style. One was designed with a lauburu that bring his silhouette on the wall, the other, on the contrary, was carved with the negative of the same drawing, achieving an artistic contribution where the two lamps are united, getting unique lamps without maintaining the same drawing. Other designs are based on the lauburu parts, trying not to break the symmetry of the drawing. The 2 wall light Fixtures used for this work are of golden color that allow its rotation, in order to guide the shadows where desired. The gourds, maintaining a rustic style in keeping the room they were, are painted in a wood color. To change bulb has an easily removable cover.